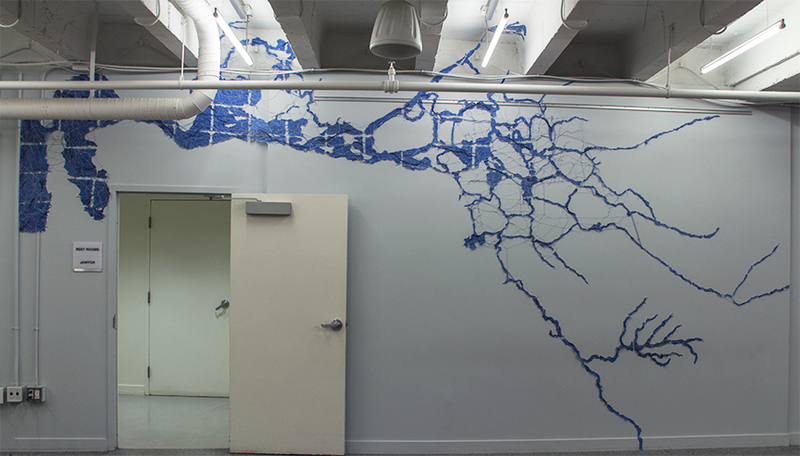 My wall installation “California Delta Rivers” is now installed at Capital One Bank Cafe 360, 101 Post Street, San Francisco, in the exhibition “What River Are You Made Of….”. The artwork is handmade paper and string and attached like a wall drawing….the challenge was getting it up and around the door! The piece is now about 15 feet x 11 feet. This piece was originally made for an exhibition also about water and the environment for a WEAD exhibition at Los Medanos College Gallery in Pittsburg, CA, and now it has been expanded to include the San Francisco Bay and highlight the Tuolumne River that is the main source of water for San Francisco and Bay Area residents. This exhibition is organized by Wholly H2O and curated by Elizabeth Dougherty. Please come to the opening reception on Thursday, Sept. 11, 6:30 to 9PM at the Capital One Cafe, 101 Post St…..or tell your friends about it. The exhibition remains on view through October 3, and gallery hours are Mon. – Fri. 7AM to 5PM. See the website at http://www.whollyH20.org for more information.